Plankton is microscopic organisms that drift on the oceans' currents. These microscopic organisms include diatoms, dinoflagellates, krill, and copepods as well as the microscopic larva of crustaceans, sea urchins, and fish. Plankton also includes tiny photosynthetic organisms that are so numerous and productive that they are responsible for generating more oxygen than all other plants on Earth combined. phytoplankton - Phytoplankton are the primary producers of the planktonic world. They are photosynthetic plankton and include organisms such as diatoms, dinoflagellates, and cyanobacteria. zooplankton - Zooplankton is the consumers of the planktonic world. As such, they feed on other plankton to obtain the energy and nutrients they need to survive. 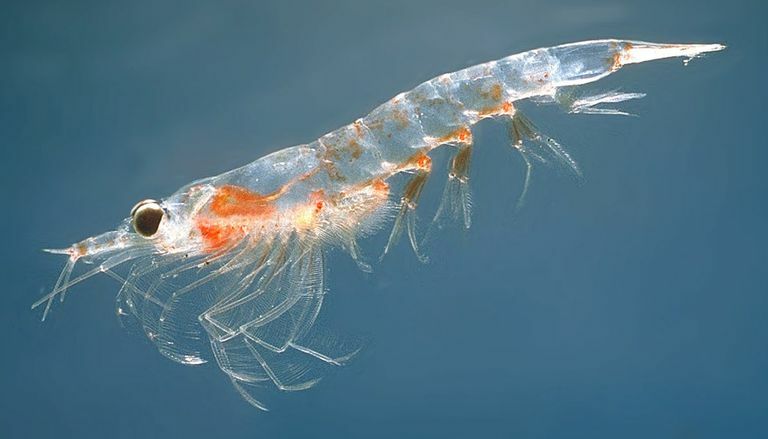 Additionally, zooplankton includes the larvae of fish, crustaceans. bacterioplankton - Bacterioplankton is the recyclers of the planktonic world. They are free-floating bacteria and archaea that serve to break down and recycle waste material in the seas. holoplankton - Holoplankton is organisms that are planktonic for the entirety of their life cycle. meroplankton - Meroplankton is organisms that are planktonic for only part of their life cycle, for example, only during the larval stage of their development. Burnie, D. and D.E. Wilson. 2001. Animal. London: Dorling Kindersley.